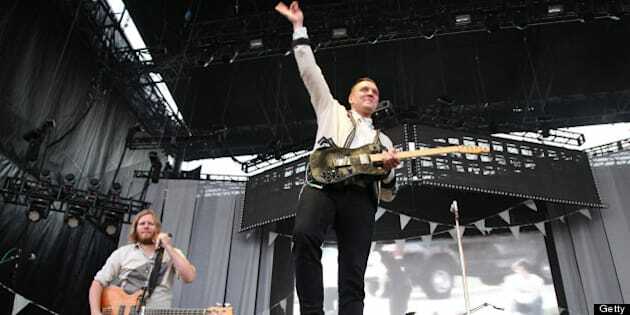 Musician Win Butler of the Arcade Fire performs at the Lands End Stage during the 2011 Outside Lands Music and Arts Festival held at Golden Gate Park on August 14, 2011 in San Francisco, California. The Arcade Fire announced on Twitter that their new album would be released on October 29. The band let the news drop in an at reply to an unsuspecting fan. There was earlier speculation that the band would release their new album in September. The album's name is still unknown. The beloved Montreal indie group's last album, the Suburbs, was also a mainstream success winning the Grammy for Album of the Year in 2011. 2013 has been an eventful year for the band. Win Butler and Regine Chassagne, the couple who are the driving force of the band, had a baby boy earlier this year. In June, Win Butler appeared on stage with the Rolling Stones in Montreal for one of the group's 50th anniversary shows.